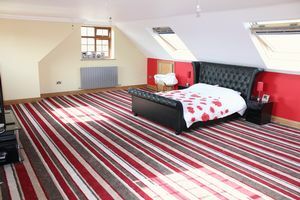 FIVE BEDROOMS - FOUR EN SUITES - FOUR RECEPTIONS - KITCHEN AND UTILITY ROOM - ROOF TERRACE - SOUGHT AFTER LOCATION! TLS Estate Agents are delighted to bring to the market a rare opportunity to acquire this heavily extended five bedroom home on the sought after Abbots Road in Hanham. 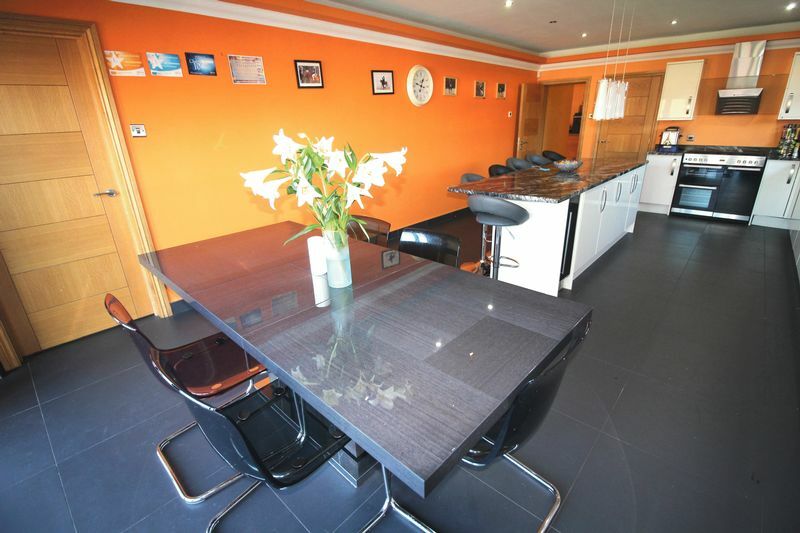 Externally, this imposing property benefits from an area of parking for several cars plus an oversized double garage with attached office. 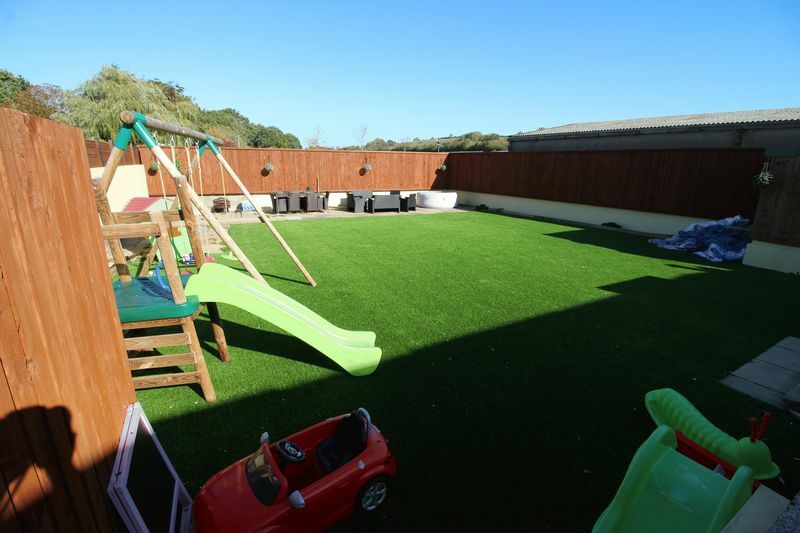 There are also front and rear gardens – low maintenance yet perfect for entertaining – plus a delightful roof terrace with views of the surrounding countryside. 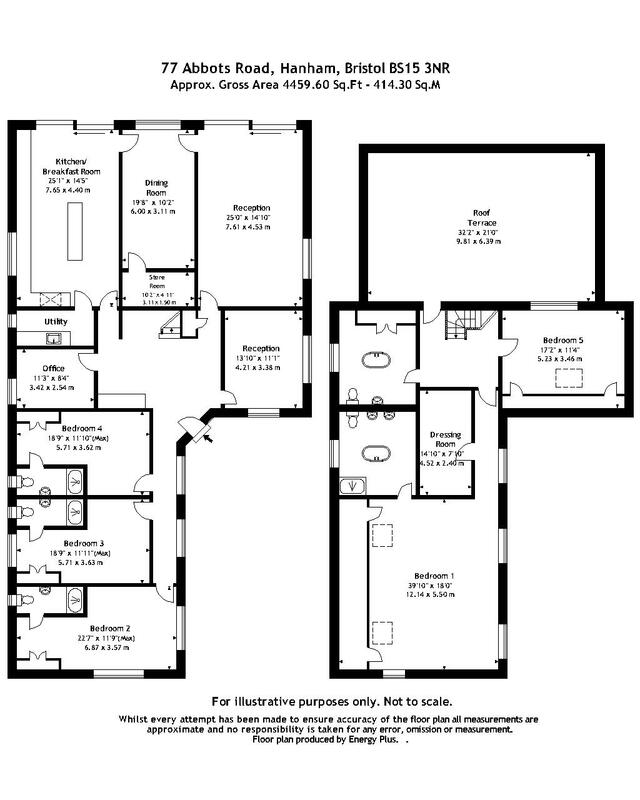 Internally, ground floor accommodation consists of a large and bright entrance hall, a snug, 25ft lounge, dining room, huge kitchen, utility room, a study and three bedrooms each with built in wardrobes and en-suite wet rooms. 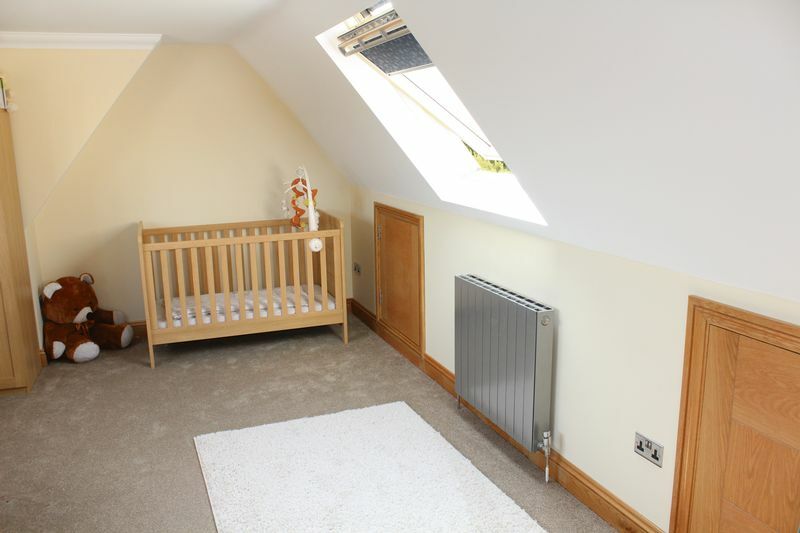 A solid oak staircase with glass balustrade inserts leads to the first floor, where you’ll find the master bedroom with windows to three sides, an en-suite plus walk in wardrobe which is bigger than the bedrooms of most other homes! 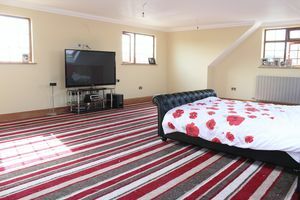 Also on the first floor is another bedroom and the family bathroom plus access to the roof terrace – another great space for entertaining. 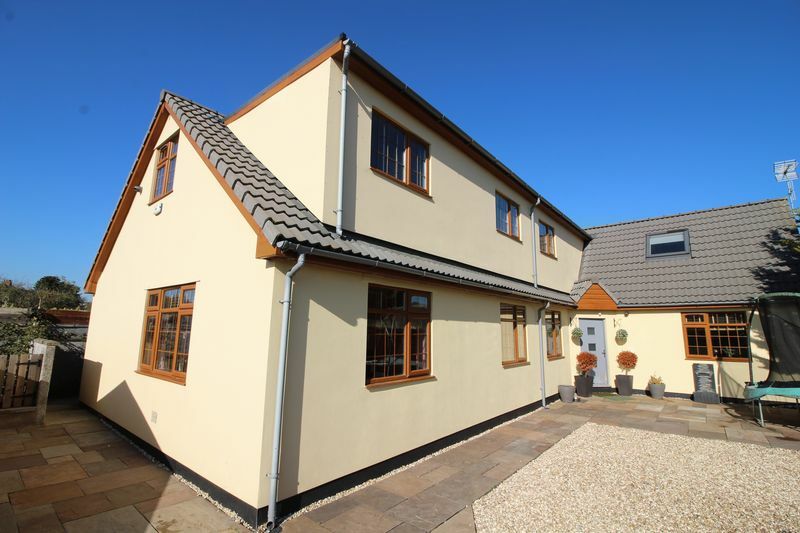 The home has been built with specification in mind including solid oak doors throughout, television points in every room (including the master en suite, kitchen and family bathroom! 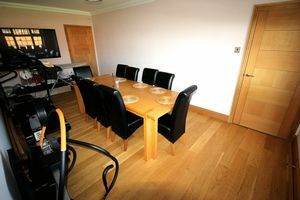 ), Bose speakers built into the kitchen ceiling, air conditioning units in the first floor bedrooms and under floor heating throughout the ground floor. 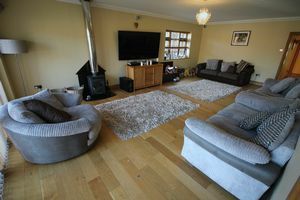 A reluctant sale by the vendors - this home has to be seen to appreicate all it has to offer! Accessed directly from Abbots Road and behind electric gates is an area of parking for several vehicles enclosed by both a traditional stone built wall and block walls with fencing. 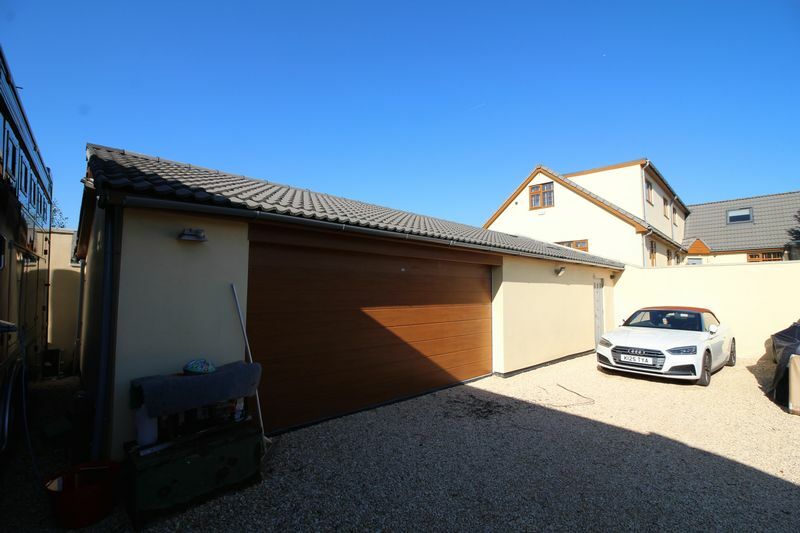 There is also an oversized double garage with attached office. Steps lead to the front garden which is laid to patio and decorative stone. Side access connects the front and rear gardens. A lovely bright room which benefits from windows to the front and side aspects, carpeted flooring, under floor heating, inset spotlights and various sockets plus television point. 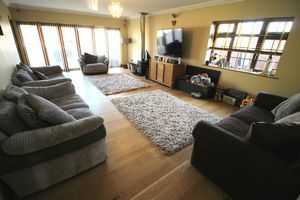 This fantastic size living room boasts wood flooring, bi folding doors leading into the rear garden plus another window to the side aspect. 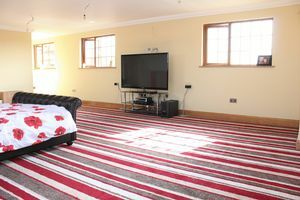 Further benefits from ceiling light and wall lights, under floor heating and various sockets plus television point. With solid oak doors connecting to both the lounge and kitchen, this dining room benefits from wood flooring, window to the rear aspect, ceiling light, under floor heating, storage cupboard, various sockets and television points. 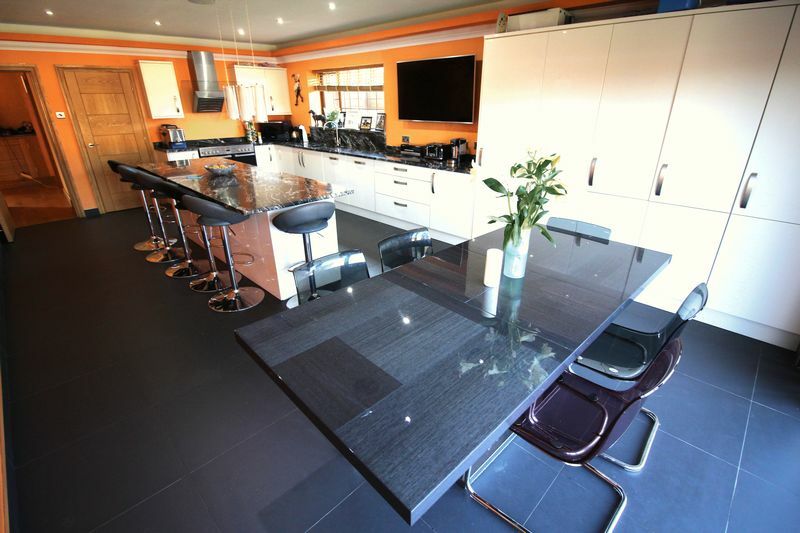 Perfect for entertaining, this kitchen houses a range of high gloss units with granite worktops, island with breakfast bar, bi folding doors into the rear garden, window to side aspect, inset spotlights plus up lighting, Bose speakers built into the ceiling, under floor heating, space for range style cooker with contemporary hood extractor over, integral dishwasher, fridge and pull out freezer. There are provisions for a sink within the island which has not yet been installed. Various sockets and television point. 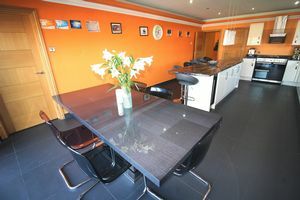 Adjoining the kitchen and separated by a solid oak door, the utility room benefits from window to side aspect, further wall and base units, inset stainless steel sink, space for side by side fridge freezer, space for washing machine and tumble dryer, ceiling light and under floor heating. 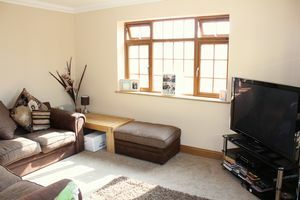 Window to the side aspect, carpeted flooring with under floor heating, inset spotlights and various sockets plus television point. 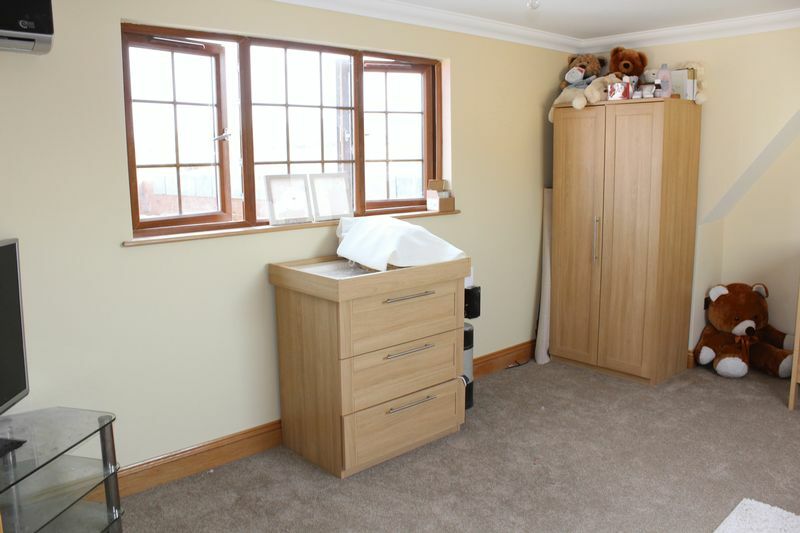 Stunning bedroom with windows to the front and side aspect, carpeted flooring with under floor heating, ceiling lights, built in wardrobe behind solid oak doors and en suite wet room. Various sockets plus television point. This bedroom is complete with en suite wet room. 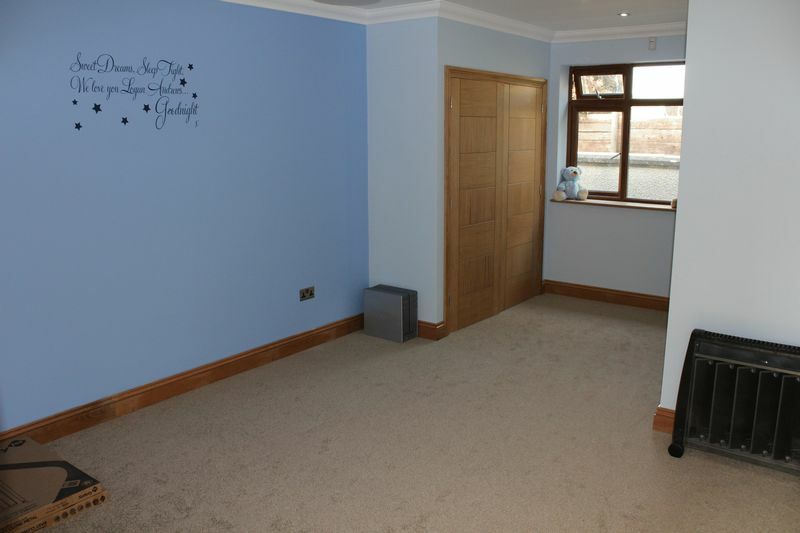 Window to the side aspect, carpeted flooring with under floor heating, ceiling lights, built in wardrobe behind solid oak doors and en suite wet room. Various sockets plus television point. This bedroom also has an en-suite wet room. Window to the side aspect, carpeted flooring with under floor heating, ceiling lights, built in wardrobe behind solid oak doors and en suite wet room. Various sockets plus television point. This master bedroom is huge and benefits from windows to three sides, carpeted flooring, designer radiator, air conditioning, storage in eaves, various sockets and television point. The wiring is present for wall lights. An en-suite to match most master bathrooms! 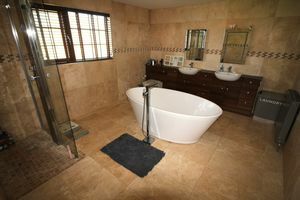 Benefits from a freestanding bath, W.C and wash hand basin built into vanity unit, walk in shower, window to side aspect, heated towel rail and television point. 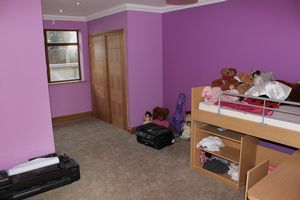 Larger than most bedrooms! 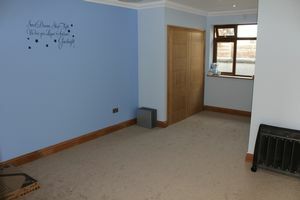 This walk in wardrobe / dressing room is carpeted and benefits from radiator and lighting. 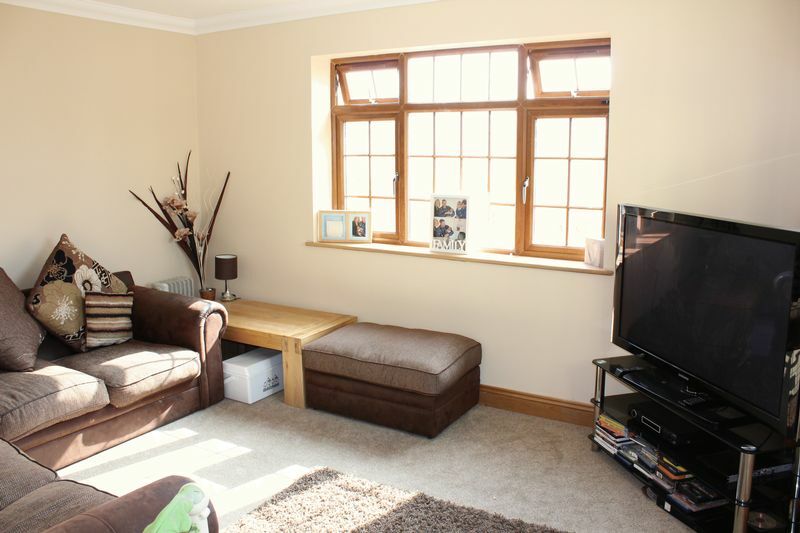 Windows to both front and rear aspect, designer radiator, air conditioning, ceiling light and storage in the eaves. 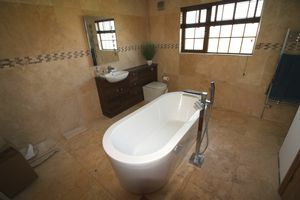 Another stylish suite comprising W.C, wash hand basin and freestanding bath. 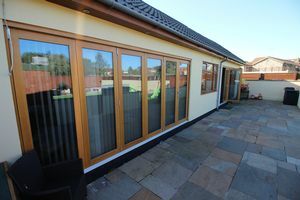 Further benefits from window to side aspect, television point and cupboard concealing hot water cylinder. Ideal for entertaining and safe for children too, this roof terrace is a sun trap with views over neighbouring fields. 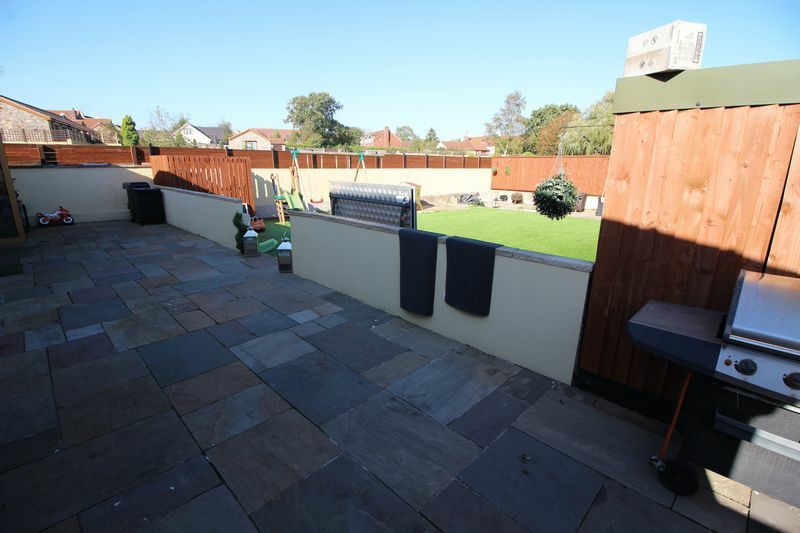 A lovely sized garden fully enclosed by wall and fencing with areas of patio and artificial lawn. Safe for children, perfect for entertaining, and with side access. A fenced screen conceals the Air Source Heat Pump which provides the properties hot water and heating.